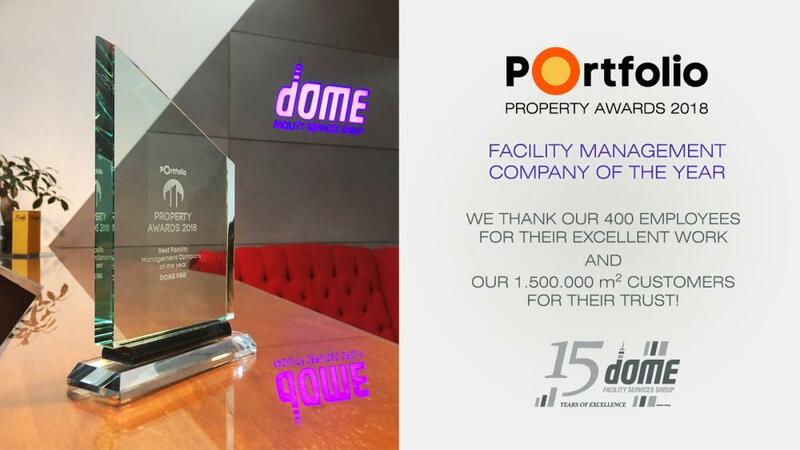 Dome Facility Services Group has been providing complete, integrated facility management services for nearly one and a half decades on the Hungarian real estate market. Our group, in addition to the FM business branch facility management activities, provides energy management services under the brand name of Dome Energy and real estate design services as Dome Fit-out, while our branch named Dome Real Estate Consulting offers complete facility management consultancy service. Thanks to its continuous, dynamic development, our company has become a dominant player in the Hungarian facility management market. The Hungarian Real Estate Association has chosen us 4 times as the Real Estate Manager of the Year, and in 2014 and 2017 we received the Facility Management Company of the Year award from the stakeholders operating in the Hungarian real estate industry. As a founding member of the 21st FM European Association, we currently offer integrated, tailor-made facility management services through our partners for large multinational companies in 7 countries of Central, Eastern and Southern Europe. We endeavour to ensure that our clients can rely on us in the long term as a reliable professional and strategic partner in achieving their business goals. As a socially responsible company, we are committed to support and build communities around us. We work not only to achieve our own business goals, but through our professional participation we are also actively supporting the development of Hungarian facility management industry. We pay special attention to environmental protection and sustainability, as well as mentoring and supporting young talents in the field of culture. As a founding member of the 21st FM European Association, we are coordinating with our international service partners the requirements arising from the use of cross-country facility management services, creating value with our commitment at both local and regional levels. As a founding member of the Hungarian Facility Management Service Providers Association, our company is committed to participate in the work the main goal of which is to create transparency in the Hungarian facility management market in order to increase the overall level of operation of the entire industry. Following the principles of the Business Council for Sustainable Development in Hungary, our group has set the goal to transplant and apply the three pillars of sustainable development, namely economic efficiency, ecological balance and social quality of life to the economic practice in order to increase its own competitiveness.